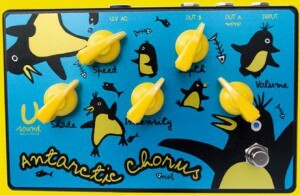 There are not many players alive who own in their arsenal of effect's pedals a Dream Pedal like the “Antarctic Chorus”! "Antarctic Chorus" is a very bright and extremely rich and dreamy Chorus effect's pedal! The Antarctic Chorus is used in every different style of music from jazz to modern trends. It sounds so rich it almost rivals the sound of a 12-string guitar. It is a pedal designed to be very Lush and is a delite to hear and play through! If you look at the block diagram of the Antarctic Chorus, it becomes evident that it is radically different from most mass-produced chorus's. In fact - this pedal features a double studio chorus (Double Chorus), in which the signal delivers not one, but two slightly different lines of delay. Due to the different time delays (at a time), mixing of the direct signal from the two detainees creates a unique surround sound effect. Another feature of this chorus is the presence in the scheme compander (compressor and expander in one crystal). In this way, it achieves a minimum level of noise from the device. The "Antarctic Chorus" is powered by an external power supply of 12V AC, 200-500ma. Signal flow through the pedal-operating passive(cold) - True Bypass.